I haven't had a sausage casserole for ages. I used to have them nearly every week when I lived with my parents, so when Cinabar passed me this Sausage Casserole Pot Noodle I was excited and dubious at the same time. 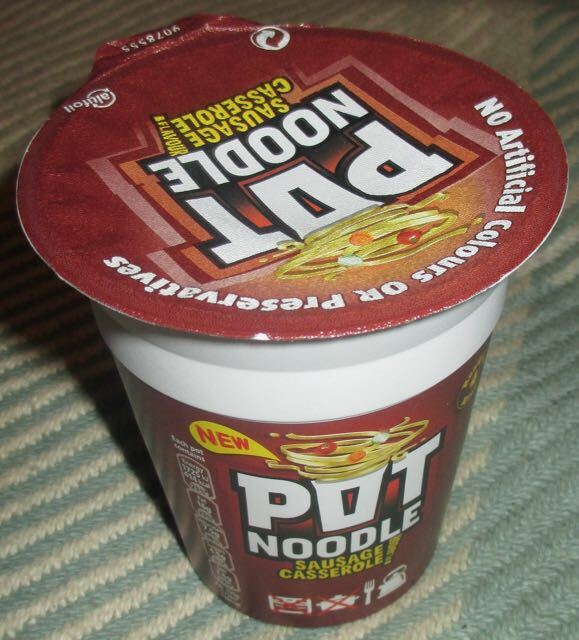 Could Pot Noodle pull off a traditional sausage casserole and without the sausages? I couldn't tell just by looking at the pot! Traditionally Pot Noodles have been the staple diet for students and late night snacks after an evening down the pub. Even though I'm waiting for a start date to begin my new job, I'm still technically a student. After a gym session and a good swim I decided to pop open this Pot Noodle and give it a try. 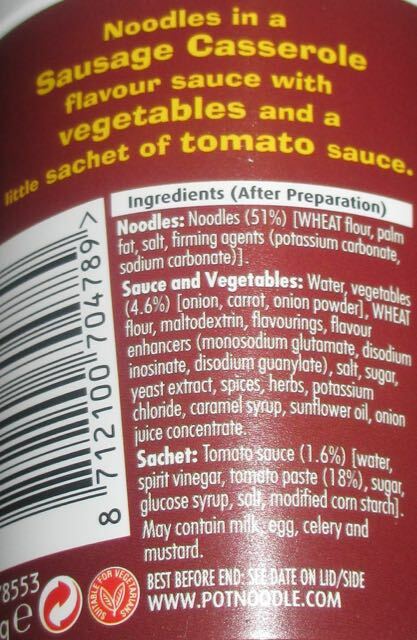 I added the sachet of tomato ketchup after the boiling water and gave the Pot Noodle noodles a good stir so the sauce and vegetables would be well mixed. The Pot Noodle had a meaty sausage smell with diced pieces of carrots and onions bobbing around in amongst the noodles and thick brown sauce. The Pot Noodle had a thick wholesome gravy sauce and meaty sausage flavour with a mixture of herbs such as parsley and sage, as well as spices such as black pepper. This was a really tasty healthy feeling meal and perfect for dunking bread. I thought that this was a really good Pot Noodle, and not just for students and boozers, so give it a try. 90g pot with 414 calories, 16g of fat, 4.5g of sugar and 1.6g of salt. Ingredients (see photograph) included no artificial colours or preservatives. Vegetarian friendly.